This beautiful pair of reflection nebulae are a small part of a large dust cloud in Camelopardalis. They contain both reflection (blue) and emission (red) components, although the emission component is subtle and can be seen as the peripheral pale red regions in the above LRGB image. 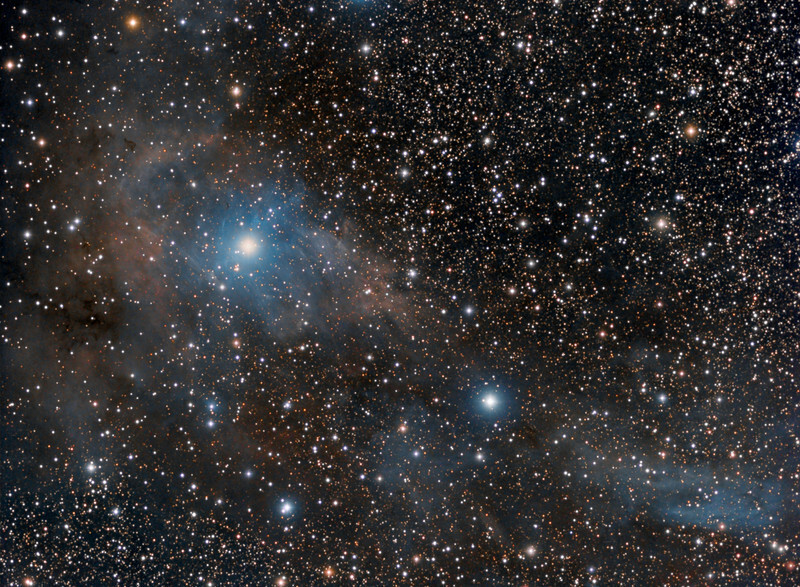 VDB 15 is the large nebula on the left, surrounding the magnitude 5 central star C Cam, while VDB14 is the sickle-shaped nebula on the lower right. LRGB image Lum bin 1x1 26x10m, R and G bin 2x2 18x5m, B bin 2x2 24x5m. TEC 140 @f5.3 and FLI ML8300 camera, Baader LRGB filters, Tak NJP Temma2 mount. Taken by Lynn Hilborn, WhistleStop Obs, Grafton, Ontario on October 08/11, 2013.